Click here to support Maru and sign her petition. The Seattle office of Immigration and Customs Enforcement (ICE) has served a “Notice to Appear,” otherwise known as a deportation notice, to Washington-based community activist and mother, Maru Mora-Villalpando. On Tuesday morning, Mora Villalpando and her supporters will announce the launch of efforts to fight her deportation and bring to light ICE’s threatening actions. 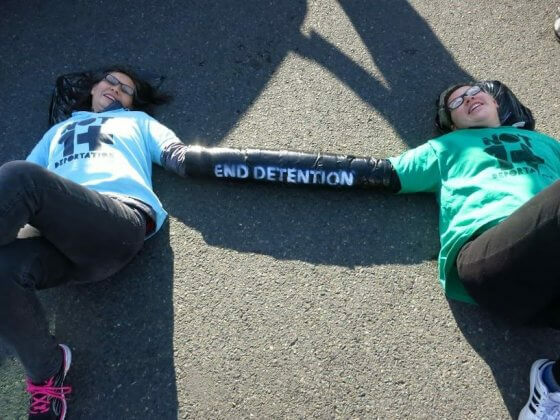 Mora-Villalpando, who has been called a “modern-day freedom fighter,” leads Northwest Detention Center Resistance (NWDCR), an organization that was co-founded when immigrants held at the Northwest Detention Center began a series of hunger strikes in 2014 protesting their inhumane treatment. Since then, Mora-Villalpando has continued to support and amplify the organizing efforts against ICE and the GEO Group (the private contractor that operates the ICE facility, the West Coast’s largest) from within the Northwest Detention Center. Buoyed by the support efforts of Mora-Villalpando and the NWDCR, people detained continue their struggle to be heard and demand justice, with nine hunger strikes at the NWDC between April and November of last year alone. Government officials have been forced to take notice; two of Washington State’s congresspeople have introduced federal legislation to reform detention, and Washington State’s attorney general has sued the GEO Group, the private prison corporation that owns and runs the Northwest Detention Center alongside ICE, citing the hunger strikes as inspiration. Mora-Villalpando’s efforts have transformed the NWDC from an ignored facility in an out-of-the-way location to a key site of local resistance, with weekly rallies and vigils outside its gates. Now, in an unprecedented and arbitrary act of retaliation ICE has chosen to target Mora-Villalpando directly, serving her suddenly with deportation papers. Immigrant rights organizers point to the targeting of Mora-Villalpando as a sign that ICE has gone beyond seeking to enforce the immigration laws. ICE is now purposely targeting people such as Mora-Villalpando who are organizing against the agency and the Trump administration’s racially-motivated deportation agenda. “ICE only knows about me because of my political work,” explains Mora-Villalpando. “I have spoken out to defend immigrants in detention and shared my story as an undocumented mother. I have sat in meetings with immigration officials and challenged their practices. They are an agency whose actions have already been devastating to my community. But with the letter they delivered to my house, they are showing themselves to be an agency that silences any opposition to their practices,” she concluded. This is not the first time the Seattle ICE Field Office targets immigrants who speak out. Just this past December the Seattle Times reported that one of their interviewees, Baltazar Aburto Gutierrez, was detained by ICE agents who cited his recent appearance in that newspaper. Other activists across the country have also been targeted by the federal agency, including Ravi Ragbir and Jean Montrevil, two leaders in New York’s immigrant rights advocacy community. 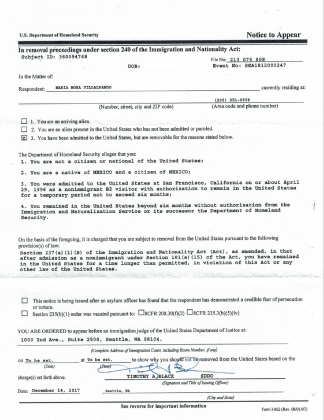 Tuesday’s press conference will also announce the filing of a series of Freedom of Information Act requests by the University of Washington’s Center for Human Rights to reveal the extent of the collaboration between the Washington State Department of Licensing and ICE, which may have led to ICE obtaining Mora-Villalpando’s home address and other personal information. “We will not allow ICE to deport Maru. Not only because we value her, but because we cannot allow a government agency that is already cruel and damaging to our communities to also silence our stories and deter our organizing,” explained Tania Unzueta, Mijente Policy Director, and one of the first undocumented organizers to start the “coming out of the shadows” strategy that undocumented youth became known for in 2010. “It is clear that Maru’s deportation notice is part of a Trump agenda that punishes people who oppose it. We are marking the moment in time when ICE agents are becoming Trump’s police force and targeting voices that counter their agenda,” she concluded. Mora-Villalpando has lived in the U.S. for over 25 years. She lives with her daughter, Josefina, who is a U.S. citizen, near Seattle, Washington. In addition to working with NWDC Resistance she is a founding member of the national Latinx organization, Mijente. NWDC Resistance is a volunteer community group that emerged to fight deportations in 2014 at the now-infamous Northwest Detention Center in Tacoma, WA. NWDC Resistance supports people detained who organized hunger strikes asking for a halt to all deportations and better treatment and conditions.